Among the other obsessions that I've previously noted, and am currently seeking treatment for, makeup ranks close to the top of the list. However, I won't buy something unless it's on sale or have a coupon. Typically I won't buy a high priced makeup product, unless it's something that I have heard rave reviews about and will last a long time. I also tend to go through periods of boredom, where I want to try something new and when there's a good price involved, I'm more willing to take a chance. Recently I did that with mascara. 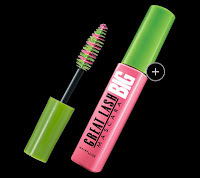 My typical choice for mascara has always been the old stand by of Maybelline Great Lash. It's been around forever and it makes the list of favorite beauty products every year and for good reason. But every now and then, I wonder if there isn't something else out there that I'd like even better. So, when Avon had a big sale recently I decided to check out their mascara collections. They had a deal where you were able to mix and match 2 of their speciality mascaras for $6.99. If you've purchased mascara lately then you know that's a pretty good deal. Most mascara now starts at that price for just one. My 2 choices were SuperCurlacious (just the name is fun!) and Super Shock (hoping as the title implies, that my lashes would be shocked into looking more full.). I've always thought the length of my lashes was okay but their fullness leaves something to be desired. I tested SuperCurlacious first and my hope was that I would no longer need my eyelash torture curler, as the product claim is that it will make your lashes 200% curlier for 12 hours. I have to say that I was pleasantly surprised how much they did curl without the torturer, er...curler. But sadly, while they did curl my lashes, it did nothing for the extreme sparseness of them. In fact I could barely tell that I had mascara on. It almost seemed as though the mascara dried too quickly, preventing the buildup you would get from a couple of coats. I purchased both mascaras in brown and am also wondering if the color was too light. Overall, I think the mascara did what it promised in terms of the curl affect, but I think I will save this for the low key days, when I'm going for the "I'm not wearing any makeup" look. SuperShock promises 12x the volume, which is what I was really hoping for. Now this product I think truly lives up to it's promise as it took barely 2 coats to make them look much fuller than normal. The brush on this mascara is HUGE though, which will take some getting used to. The other problem is that with a brush this big, it holds A LOT of mascara on it. So you need to spend A LOT of time trying to wipe the excess off before applying it, otherwise you'll end up with clumps (check out my 2nd picture below). Normally I don't wear mascara or just a very tiny amount on the bottom lashes, but as I am testing a product I wanted to give it a full review, so excuse the messy look! I think the first picture better shows the effectiveness of the product. So, one slight thumbs down and one thumbs up...not bad. I think I'll use the Supershock for the times I really want my lashes to stand out and stick with my Maybelline Great Lash for my day to day look. So, what about you? Are there any makeup products that you can't live without? Something new you tried and loved? Share, Share, Share!!! Have you tried fake ones? I'd love to try false eyelashes but they look too tricky! @ Jotter - They do look great and I'm convinced they use them in most mascara ads....With my luck I would probably glue my eyes shut! :) Would be fun to try them out for Halloween! Oh girls... I have a hundred years of mascara experience to share. I worked for Lancome in the '70's. They've always been known for their great mascara's. I continued to use their mascara even after I no longer worked for them... as long as I made enough $$ to afford them. When their mascara's topped $20 I left. I tried lots of others but finally ended up with Maybelline's Full and Soft line. I love it! And, my lashes are long but not terribly full, like yours Adrienne. It doesn't make them stiff and I like that. As for false eyelashes... Again, back in the olden days... I used to wear falsies (lashes of course) on occasion. The easiest to use are the semi-individual ones that you can put on where you want them. You can cut regular ones and do this procedure, too. You just dip the root end in the glue, while holding it with a tweezer, and place it on top of your lashes. Easy peasy... after a few tries. Wigs were big in the '70's, too. I was trying to grow my hair out and had a couple of wigs to ease the pain. We had a small dinner party one night and I had on the wig and the lashes. I went to check something in the oven and when the heat smacked me in the face I heard "sssst" Oh crap! The front of the wig and the lashes looked like frizz! Moral of that story... Don't entertain while wearing falsies of any kind! @ Barbara - LOLLLLL! I can so see the frizzed wig and lashes! The things we women do for beauty! I don't have a particular makeup that I am hooked on, but I have been using and really like Physician's Formula Mineral Loose Powder and their Multi-Colored Blush. I wanted something easier on my skin so I would have less breakouts. Wegmans carries it and it lasts a really long time. Love Wegs!